Fjord Norway is the part of Norway’s west coast with the most famous fjords. It stretches from Stavanger in the south to Kristiansund in the north and consists of four counties: Møre & Romsdal, Sogn & Fjordane, Hordaland and Rogaland. A very special part of the region is The West Norwegian Fjords of the Geirangerfjord and Nærøyfjord which are both on the UNESCO world heritage list due to their exceptional beauty with narrow straits and high mountains steeping right down to the water. They were voted as the world’s best preserved attractions on the UNESCO list by National Geographic in 2009. While they are virtually unspoiled, you won’t be visiting them yourself in the summertime. But don’t despair, there’s lots of easy accessible areas where you’ll hardly see another person and can be alone with some of the most spectacular nature on earth. The west coast of Norway is highly exposed for rain and quickly changing weather and is not the place to get a tan, but by choosing the back roads and taking detours to your goal destination, or when spending an extra day on a boat on the fjord, the area will give many experiences and memories that will last a long time, with or without a camera. This makes the area very well suited for road trips and is also a popular destination for super yachts. Someone feeling a bit alive dangling his feet 604 meters above the water below at the Pulpit Rock (Preikestolen). During the summer, sleeping in Fjord Norway is probably best done directly under the stars. There is beautiful nature just about everywhere, and if you have a tent or a caravan you can place almost anywhere you like (because Norway has allemansretten) as long as it is 150 meters from the closest house. If you prefer just a bit more comfort there are plenty of camping sites along most of the roads in Fjord Norway where you get access to toilets, showers and running water. For more accommodation ideas, De Historiske Hotel & Spisesteder, the historic hotels and restaurants association, has more members spread over the area that will be a cut above any random hotel. In the small town of Øye, with about 60 inhabitants, right by Norangsfjorden, is a rather spectacular hotel in a spectacular location surrounded by the Sunnmøre Apls. Hotel Union Øye was established in 1891, and has for long been a destination for royalties, writers and other dignitaries. This is also shown by the photographs of visitors in one of the hotels saloons. Fjord Norway is not the place you travel to in first hand if looking for luxury shopping. However, there are some good places to visit to stack up on outdoor gear and clothes. Norway is most known for its amazing nature and this means that different types of ecotourism are very popular. The Norwegians themselves love to hike and see it as their natural occupation on Sundays, which could be a reason that everything is closed on Sundays – including almost all grocery stores. There are climbing parks, river rafting, fishing and whale safaris available in addition to different ways of just enjoying the nature. Cruising ships and Hurtigruten are popular ways of seeing the coast line and the fjords, but the ferries you will encounter while driving almost work equally well. The Bess Ridge (Besseggen) center top-right and a little bit of the hike there. 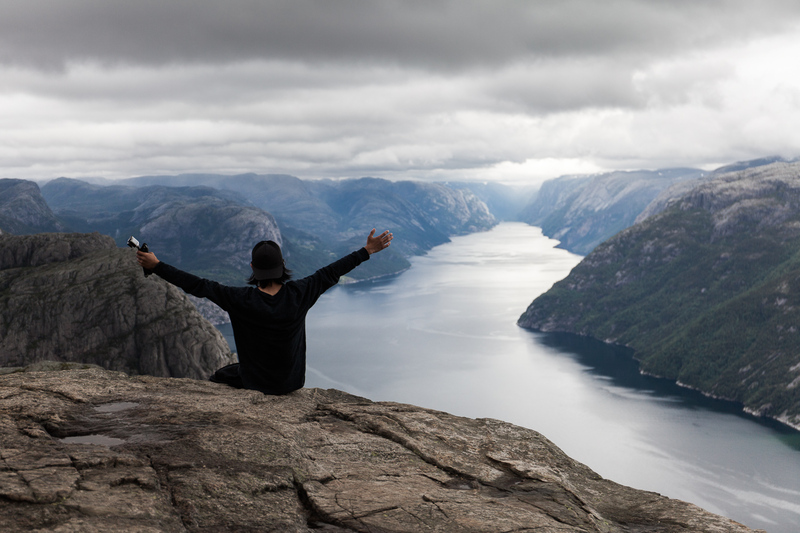 Preikestolen, Stavanger: 4 km, around 4 hours with a stop at the iconic Pulpit Rock, a 25 by 25 meter plateau reaching out 600 meters above the water of Lysefjorden. Lots of tourists, so start early or even during the night to see the sun rise at the top. Over Vidden Fløyen to Ulriken, Bergen: 13 km, around 5-6 hours where the first 1/3 is serene and beautiful with spectacular views over Bergen and the rest a bit rocky and wet with mile-wide views towards the goal. 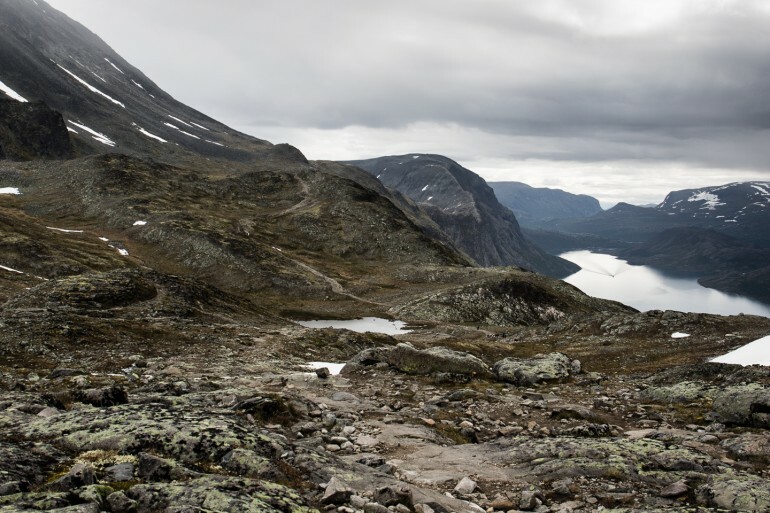 Besseggen, Jotunheimen: 13.3 km and 6-8 hours, perhaps the most iconic and popular hike among the Norwegians. Most start by taking the boat to Memurubu and walk back to Gjendesheim up over the ridge. Stand in line early for the boat, around 7 a.m. to catch the first one and bring warm clothes with a cap and gloves even in the middle of the summer, you need to use your hands at a couple of places and it’s a bit airy, but not difficult. Romsdalseggen, Romsdalen: 10.4 km and one full day, if Besseggen is too easy and not exposed enough, then Romsdalseggen is something for you. Know your limits if there’s bad weather. Slogen fra Øye, Sunnmørsalpene: There’s an easier way up to Slogen, the impressive pyramidal peak 1564 meters above sea level, starting at around 800 meters up but this route goes directly from Øye where you can stay at Hotel Union. The peak looks daunting but is quite easy to ascend, it’s just the last 100 m that can be a bit exposed. 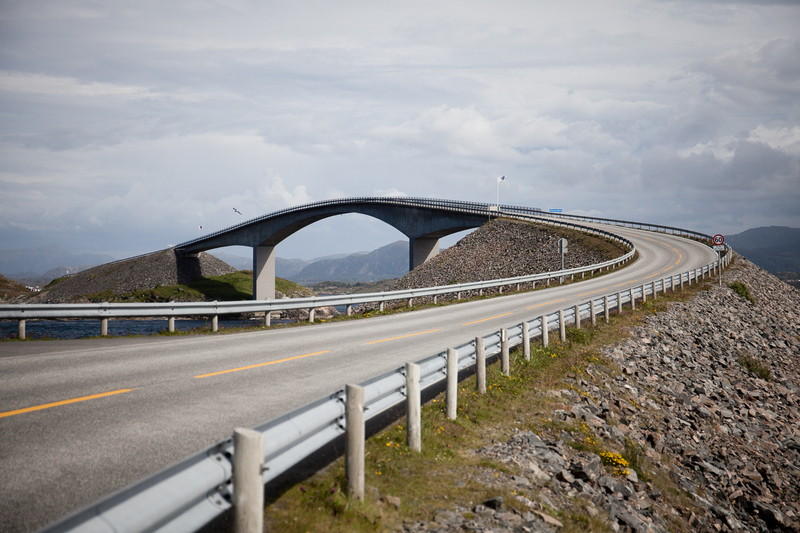 All the mountains has made some fabulous roads along the fjords or over the passes to the next one. Just pick a goal and you’ll be greeted with flowing curves and lots of height differences. Some roads are narrow and some are mainly tunnels, but every once in i while you get to be alone and able to just enjoy what’s offered to you. Atlanterhavsveien, an 8 km stretch of the national tourist road Atlanterhavsvegen between Bud and Kårvåg north of Ålesund is one of the most recognizable stretches of road anywhere on the globe and ranked at the very top of scenic roads that are attractions on their own. 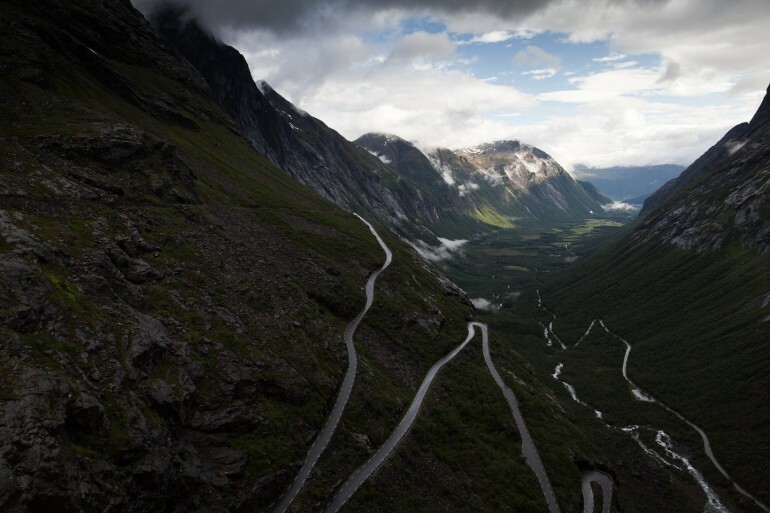 Trollstigen is another globally famous stretch of road, only open during the summer months. This is the road for someone who likes hair pins, there are eleven of them on the way up the mountainside 850 meters above sea level. Be here before 9 a.m. to be able to have drive at your own pace. View over Trollstigen and the Ister Valley. ©2014 Never Grow Up Magazine, contact us at through the contact page or @nevergrowupmag on Twitter. Designed by FairPixels.com and modified by Never Grow Up.